Version 3.23 released on July 15, 2018. It conducts some minor fixes. LIBSVM tools provides many extensions of LIBSVM. Please check it if you need some functions not supported in LIBSVM. We now have a nice page LIBSVM data sets providing problems in LIBSVM format. We now have an easy script (easy.py) for users who know NOTHING about SVM. It makes everything automatic--from data scaling to parameter selection. The parameter selection tool grid.py generates the following contour of cross-validation accuracy. To use this tool, you also need to install python and gnuplot. To see the importance of parameter selection, please see our guide for beginners. Using libsvm, our group is the winner of IJCNN 2001 Challenge (two of the three competitions), EUNITE world wide competition on electricity load prediction, NIPS 2003 feature selection challenge (third place), WCCI 2008 Causation and Prediction challenge (one of the two winners), and Active Learning Challenge 2010 (2nd place). Automatic model selection which can generate contour of cross validation accuracy. The current release (Version 3.23, July 2017) of LIBSVM can be obtained by downloading the zip file or tar.gz file. You can also check this github directory. Please e-mail us if you have problems to download the file. The package includes the source code of the library in C++ and Java, and a simple program for scaling training data. A README file with detailed explanation is provided. For MS Windows users, there is a sub-directory in the zip file containing binary executable files. Precompiled Java class archive is also included. Please read the COPYRIGHT notice before using LIBSVM. 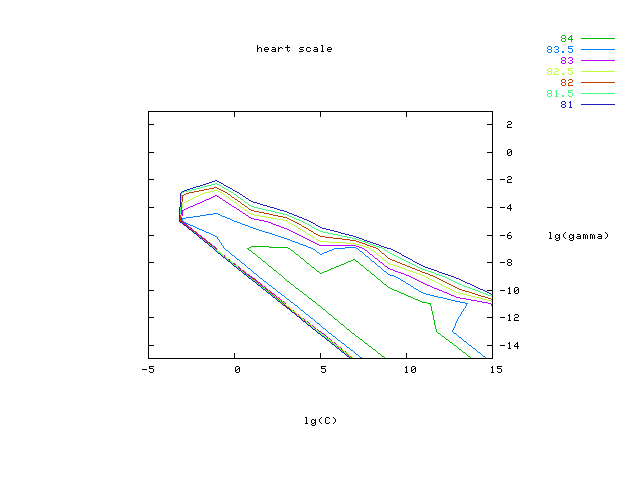 Here is a simple applet demonstrating SVM classification and regression. Click on the drawing area and use ``Change'' to change class of data. Then use ``Run'' to see the results. The k in the -g option means the number of attributes in the input data. To install this tool, please read the README file in the package. There are Windows, X, and Java versions in the package. pdf, ps.gz, ACM digital lib. Instructions for using LIBSVM are in the README files in the main directory and some sub-directories. An introductory video for windows users. R.-E. Fan, P.-H. Chen, and C.-J. Lin. Working set selection using the second order information for training SVM. Journal of Machine Learning Research 6, 1889-1918, 2005. You can also find a pseudo code there. B. Schölkopf, A. Smola, R. Williamson, and P. L. Bartlett. New support vector algorithms. Neural Computation, 12, 2000, 1207-1245. B. Schölkopf, J. Platt, J. Shawe-Taylor, A. J. Smola, and R. C. Williamson. Estimating the support of a high-dimensional distribution. Neural Computation, 13, 2001, 1443-1471. Acknowledgments: This work was supported in part by the National Science Council of Taiwan via the grant NSC 89-2213-E-002-106. The authors thank their group members and users for helpful discussion and comments. Please send comments and suggestions to Chih-Jen Lin.